NEW YORK (AP) After getting a pep talk from his coach, Jamal Murray came through with a big game for the Denver Nuggets. 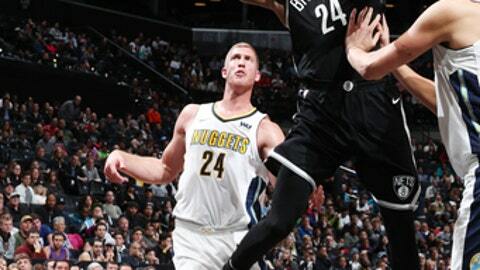 The Nuggets went on a 22-4 run to begin the third quarter as Brooklyn missed 10 of its first 11 shots. Chandler carried Denver in the third with 14 points as the Nuggets took a 100-84 lead into the fourth quarter and never looked back. Hollis-Jefferson led Brooklyn with 16 points at the half as the Nets took a 63-60 lead into the locker room. Brooklyn’s 63 points matched a season-high for points in the first half previously done in the season opener against Indiana. Emmanuel Mudiay led Denver with 15 points at the half. Nuggets: Malone believes his young backcourt will be the key to success this season. ”The biggest challenge for us is going to be when you have a 21-year-old backup point guard and a 20-year old starting point guard, there are going to be inconsistencies. Can we try to help them and speed up their maturation as players? Because we have big plans, we want to be a playoff team and when you have two young guards who are going through growing pains at times, it doesn’t make it always easy.” . Juancho Hernangomez (mononucleosis) was out.